Women have clearly defined views and opinions about lifestyle video content. As part of the POPSUGAR Insights/ulive 2014 lifestyle video study, we asked women to tell us what they'd like to see more of in the online lifestyle video content that they consume. They were more than willing to share! 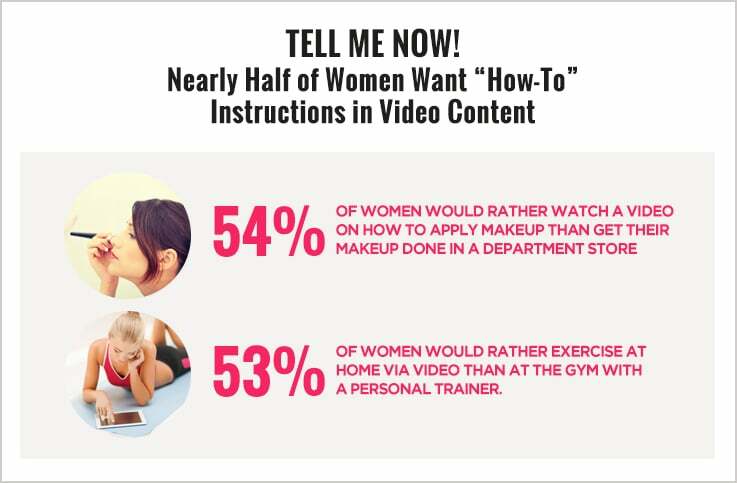 Overall, 49% of women want to see more videos that provide "how-­to instructions" on how to accomplish the task, cook the meal, get the look, or learn an exercise. Women seek more personalization, including content that is based on their interests (46%), and they seek content that is authentic (40%), trustworthy (36%), and short and high quality (30%). Women seek tips and advice from streaming video content at home. Due to women's increasingly busy lifestyles, they are turning to online videos to teach them new skills such as exercises and makeup techniques, instead of traditional in-person instruction. For example, 54% of women would rather watch a video on how to apply makeup than get their makeup done in a department store, and 53% of women would rather exercise at home via video than at the gym with a personal trainer. Women also actively seek ways to shorten the purchase process and would love to have more information about where to buy the products they see in the videos (23%), reviews about the brand (21%), additional information about the brands shown in the videos (19%), and the ability to purchase the product shown in the video (17%). Interestingly, when asked what would improve their overall enjoyment of lifestyle videos, 36% of women said they would like a gamification element added to their consumption where they would earn points or rewards for watching videos (36%). Avid lifestyle video viewers (women who watch 240+ minutes of lifestyle video per month) are more likely to seek how­-to instructions and tutorials (58%) than either moderate viewers (44%) or women overall (49%). Heavy viewers are also more likely to seek out content that is perceived to be authentic or real (48%) and trustworthy (43%) with hosts who are passionate about the topic they are discussing (38%). Heavy viewers are also more interested in where they can buy the products featured in the video (32%) than moderate viewers.